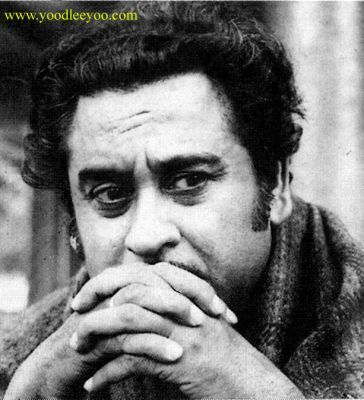 Kishore Kumar » Blog Archive » A Man of Many Moods..
Home » Kishore diary » A Man of Many Moods..
A Man of Many Moods..
Whoever thought that the small boy born to a family in Khandwa in the year 1929 would become a national legend one day? Well, to be honest, not many. Kishore Kumar was at first seen as only Ashok Kumar’s younger brother. But he was not one to sink into oblivion like his other brother Anoop Kumar. On the contrary, Kishore Kumar grew to be an even greater talent than his elder brother. Not only was he a great comedian, he also sang for a variety of heroes. Superstars rose and fell and the industry changed from one color to the other, but one thing that was quite constant in this time was that Kishore Kumar sang for all of them- right from the early years to the 70s, Kishore Kumar’s voice was heard by all cinema goers. Though mostly remembered for his comic capers and phenomenal block busters like Chalti Ka Naam Gaadi, Half Ticket, Nau Do Gyarah and a score of others, there was another facet to this gem of the Hindi film industry. Under this smooth talking, grinning face that launched a thousand films, there existed a deeper, more intellectual man. This man struggled hard to come out of the comic cocoon that was weaved around him, but alas, the opportunities to do so were rare and largely unrecognized. There was no one interested in casting this master comedian in anything but comedies. No director gave it a second thought to cast him in a serious role. Kishore Kumar was simply not given the opportunity to portray a more complex character. So what did he do? Did he give up? Not in the least. Instead of brooding over his condition, this multi talented genius simply created such a role for himself. He took to the director’s seat and created films that spoke about the maladies of life. One such film was Jhumroo. Though today people mostly remember it for the famous title song, the plot of the movie was way ahead of its time and Kishore Kumar has essayed the title role with such brilliance- it is utterly remarkable. The anguish, pain and heart break has been felt in the most perfect manner and create a feeling of empathy towards the poor soul. Then he went on to create Door Gagan Ki Chaaon Mein in 1964 which was another proof of his mastery. Once again, he has played the lead character’s role and has done so with great aplomb. The movie brings a tear to one’s eyes when Kishore Kumar is with his mute son in the film. There have been very few instances which can be touted to portray the bond between a father and a son more perfectly than Kishore did. Another movie which showed the veteran actor in a different light was Door Ka Raahi. Like the previous mentioned, this was also his own creation and the movie has been made on a different level all together. The story, the detailing and the complex characters shows that Kishore was a lot more than the world has acknowledged him for. Why is that true genius is never honored in its lifetime? Well, whether others accept it or not, this article is dedicated to a wonderful actor who was an all rounder and most of all- a truly talented human being. This entry was posted on Tuesday, May 15th, 2007 at 8:22 pm	and is filed under Kishore diary. You can follow any responses to this entry through the RSS 2.0 feed. You can skip to the end and leave a response. Pinging is currently not allowed. Silly typo – Kishore was born in 1929. Loved him as a singer but didn’t really enjoy his slapstick humor a whole lot. New Delhi was OK (his acting was amateurish, esp in the end), Jhumroo was a big disappointment and I just fastforwarded through the whole thing and returned the movie in 15 minutes. Loved the songs of “Dilli Ka Thug” but as an actor? I loved Ashok Kumar as an actor – one of my favorites. Kishore was a great singer who did other things OK. In all of this stories, a beautiful girl for no specific reason just falls in love with him. Favorite Kishore movie: Dilli Ka Thug and Chalti Naam Ki Gaadi; the funniest part of Chalti Naam Ki Gaadi was when he went to collect 5 rupees from Madhubala. I, like man, preferred Kishore Kumar the singer over the actor. Unlike many, I thought the singer was much much better than the actor in terms of quality. I loved his songs but some of his movies were utterly disappointing. He certainly had talent for slapstick (although I’m not particularly fond of slapstick as opposed to the situational comedies of Hrishikesh Mukheree) but some of his movies were terrible – Jhumroo (what I thought was famous) comes to mind. I just fast forwarded through most of it. The guy being whipped – why show that? New Delhi was OK (the ending was weak and you clearly knew that this was just a feel good movie where in the end they cut and paste things together – Kishore the actor was not partcicularly convincing). I liked Dilli Ka Thug and ESPECIALLY the songs. A movie where Kishore did an EXCELLENT JOB (and I wouldn’t classify this as slapstick) as an ACTOR was PADOSAN. One of my favorites and I loved Kishore in there. It was great to see him do a tribute to playback singers by playbacking himself! As for Kishore the singer…I’m so glad we have his songs to enjoy! I’ll revise myself (and sort of contradict) – Kishore was a great slapstick actor. I’ll still need to see more of his movies, haven’t seen a whole lot (and didn’t want to after the first) but all the movies I mentioned are the only ones of his that I’ve seen. Sorry for the double post. I see this is a KK site – if I have a problem with him, then I shouldn’t be here. This is the LAST time I’ll make a mistake. I’m sorry to compare or put down KK. I love him as a singer and am grateful I enjoyed his work. No more silly stuff from me. Kishoreda is the greatest singer,actor and performer of all times.Jai Kishore bhaagban ki Jai!!! Debjyoti………… ek hi raag alaap karna aat hai…….. aur kuchh likhna nahin aata hai kya? Kishoreda is the best,much greater than Rafi. Bapan, only you have to say it………. Can you ? BTW, who is the author ? no name, nothing. Hats off to Kishore Kumar,the genius. answer what been asked dear kk fans………. Anil Biswas liked KK more than Mohd rafi as said by some of u plz answer me why Anil Biswas used only for two flims one in 1953 and other in 1956 and he used Mohd rafi for seven flims upto 1958??? WHY NAUSHAND USED KK ONLY IN ONE SONG? WHY LP USED MORE MOHD RAFI FOR R KAPOOR AND BACHCHAN IN END OF 70’S?WHY ANWER GAVE PLAYBACK FOR RAJESH KHANNA AND MOHD RAFI? I wish Kishore Kumar had made more movies with Mehmood. I loved Padosan – just watched it again. KK’s kind of humor (slapstick) combined with Mehmood’s different kind of humor would have made a colossal combination – one that would be far superior than the sum of the individutal parts. I’d argue that Mehmood’s most famous comedy movie is indeed his only partnership with KK – Padosan. KK would have continued to make more movies like Padosan with Mehmood if his singing career didn’t skyrocket only a year later. He became too busy for movies afterwards. Rafiji’s the best of all, Kishore Kumar is the next to follow Rafiji. here in London, I asked many of my friends and collegues, they vote for Rafiji only. Rafi is nowhere near Kishoreda,Kishoreda is the greatest. 6 month back, I had to waited at London airport, it was stop-over. I was surprise to hear one angrez humming song from MILI. I stopped him and ask him abt this songs, and he replied me that he happened to hear this songs from his indian friend’s collection. He become fan of KK. This is truth. My dear`friends. the good work because London is full of RAFI FANS.. Sorry Ashu, but I have asked others too, here in London most people are Rafiji’s fans. Others haven’t heard of KK very surprisingly. Rafiji is world famous. Monty bhaiya, do you mean the ‘taxi drivers’ in London? All successful men listen to KK more than Rafi. Rafi is meant for ‘sad people’. Kishoreda is the greatest of all…. including Rafi…. i love Rafi’s sogs too, but it does not compare with the great Kishore. Like someone said, Kishore Kumar is born once in 500 years. « An endless feud between the fans of Mohammed Rafi and Kishore Kumar..